I actually liked the height and airiness of your vase, it looked very well balanced to my eyes. The peonies are a revelation; although I suppose I should have realised, it’s what commercial growers do all the time! But very good to know all the same. It was amazing to have so many peonies this year. In past years I’d stored 3-4 but not for this long. Happy to have my refrigerator space back though. Looks like summer happiness to me! It is a happy summer here Marian! We could use some rain. Around the time you said you had a gullywasher, we didn’t even get enough drop to wet the patio. 95 degrees today too, so I did actually water. I’m with Christina; I really like the height and airiness. I think of Echinacea as heavy flowers but you’ve made them feel much more light. Enjoyed your Aconite comment to Cathy. 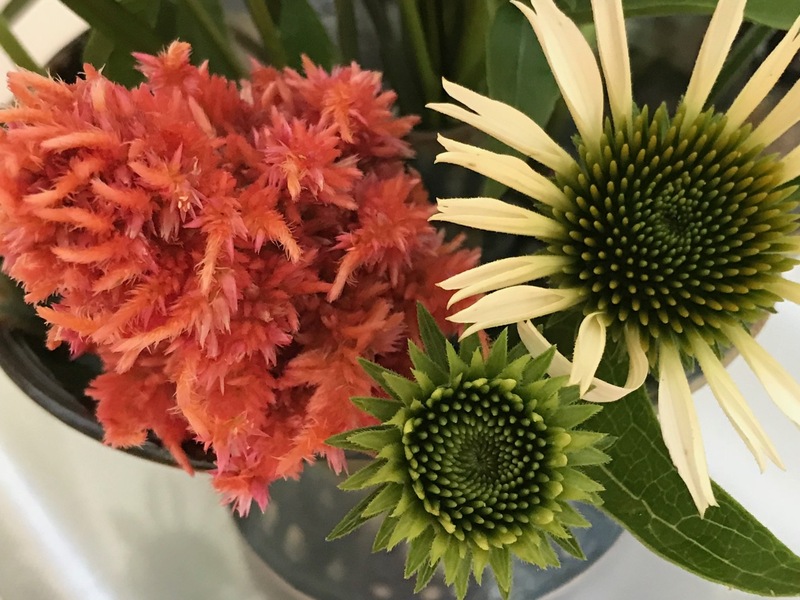 Thank you LInda, I agree they are a bit heavy and the stems of echinacea are very stiff, actually rather hard to work with. Now I need to look for an unsuspecting Aconite at the garden center this week. I love your Echinaceas. I am still fascinated with the peonies in the refrigerator for all that time. It’s been a good year for echinaceas. They are drought-resistant but seem to appreciate plenty of water, which we had this spring. None now for 3 weeks. I too love the height and airiness of your vase Susie, and love how you used the grass. I have found grasses can certainly be a problem as they take over some gardens so I am cautious with them in my garden. Thank you Donna. The idea I had in mind didn’t match the reality, but I’m happy it still turned out to be interesting to you and others. Thanks Cathy. I expected much more from that grass! 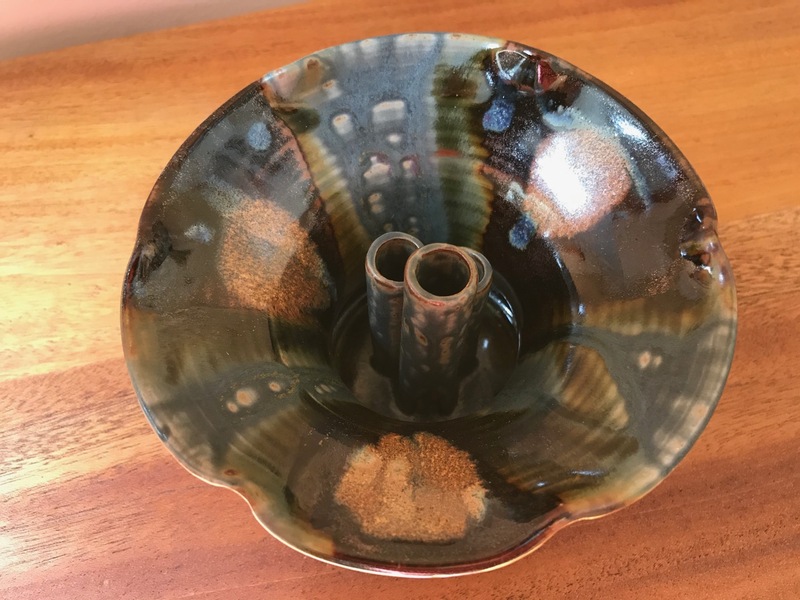 The vase is nice but the three stem holders don’t hold very much, so how many stems I could use and get to stand up were affected by the size. Kept wanted to tuck in some more flowers but nowhere to put them. I was surprised how much the cylinders did actually hold though, but at least you will be able to gauge the quantity of material next time you use it. Is the grass underwhelming? What were you hoping from it? Exactly, underwhelming. 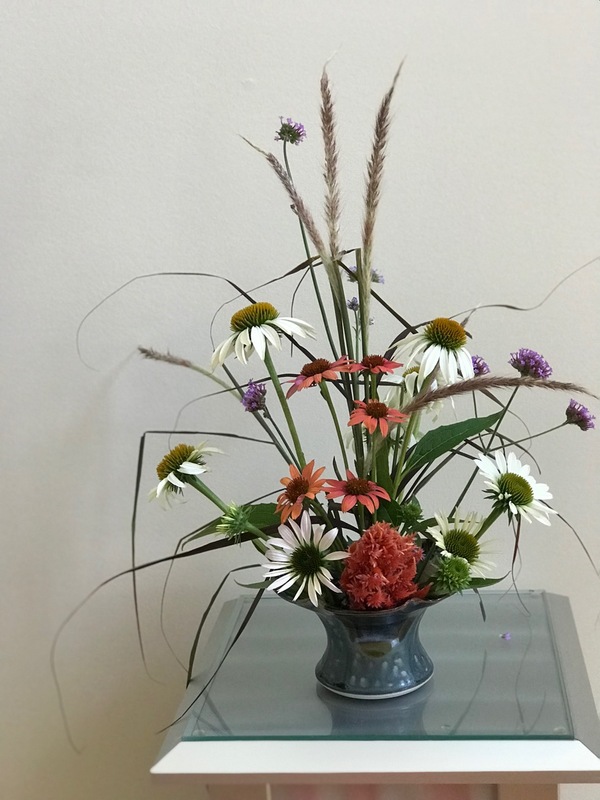 Had planned to use mostly the flowering grass with only a bloom or two from the echinacea. Kind of got carried to a different direction. That’s ok, always next week! I love the airiness of your arrangements, Susie. I wish I was wired to exercise a similar level of restraint. The immature green Echinacea is a great touch too. Echinacea make beautiful focal points and I’ve been tempted to buy some plugs for my garden but the flowers struggle here and rarely come back for a second year so I’ve hesitated (so far). Thanks Kris. You have such profusion of blooms it would be hard to show restraint! That looks like something from the prairie. We just got coneflowers at work. 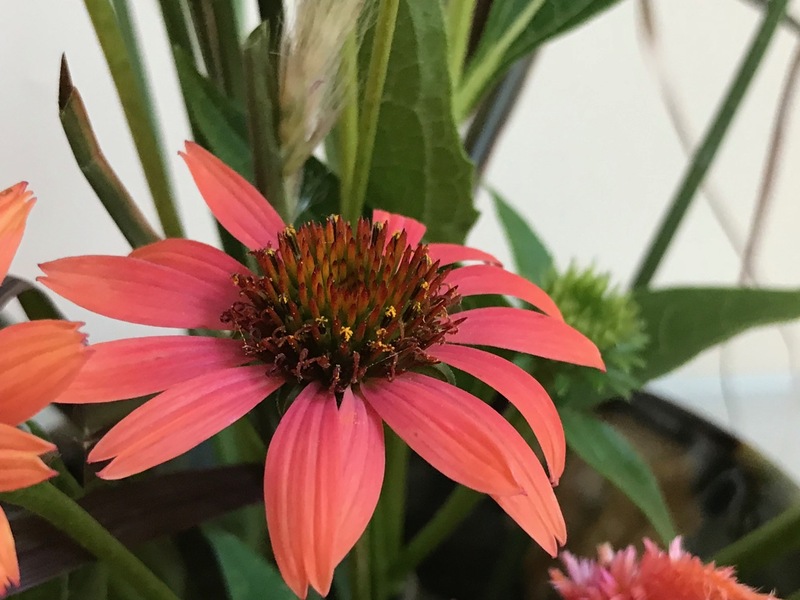 One of our associated who does not work in the landscape is Mr. Cone, so I told him that coneflowers were named after the famous botanist that discovered them. He was not amused. Echinacea is native to this part of US. Likes moist prairies and meadows (and fortunately my garden as well). I like the Echinacea vase, it looks like a meadow soon to be filled with bees and butterflies. 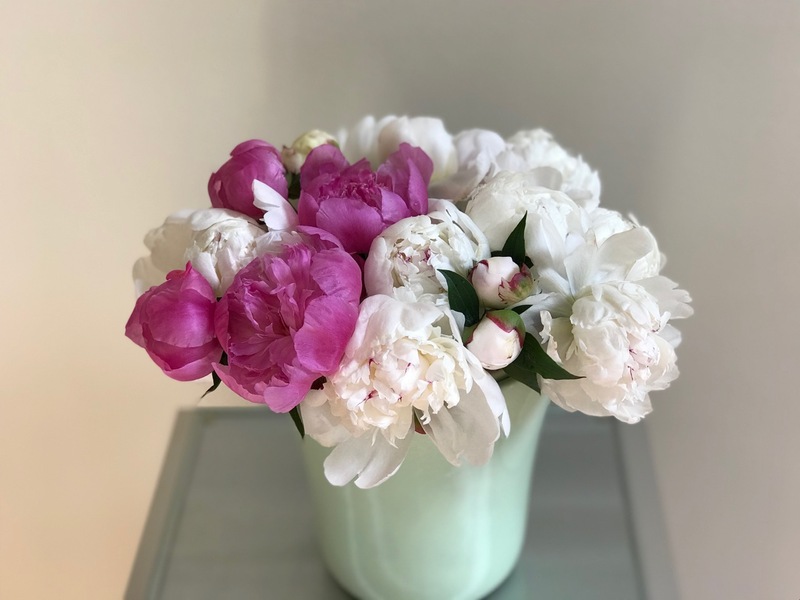 The Peonies are amazing, I am amazed at how long they lasted. I feel the same way about grasses, many look like Johnson’s Grass (huge weed) to me. I do like Muhly Grass and Pennisetum. Thanks. Outdoors the bees and butterflies have really been enjoying the echinacea. I’m terrible at identifying weeds but am pretty sure Johnson grass is what I was pulling out of the garden this morning. Oh, that is so professionally done, and I love, love, love the vase! Thanks Beth. 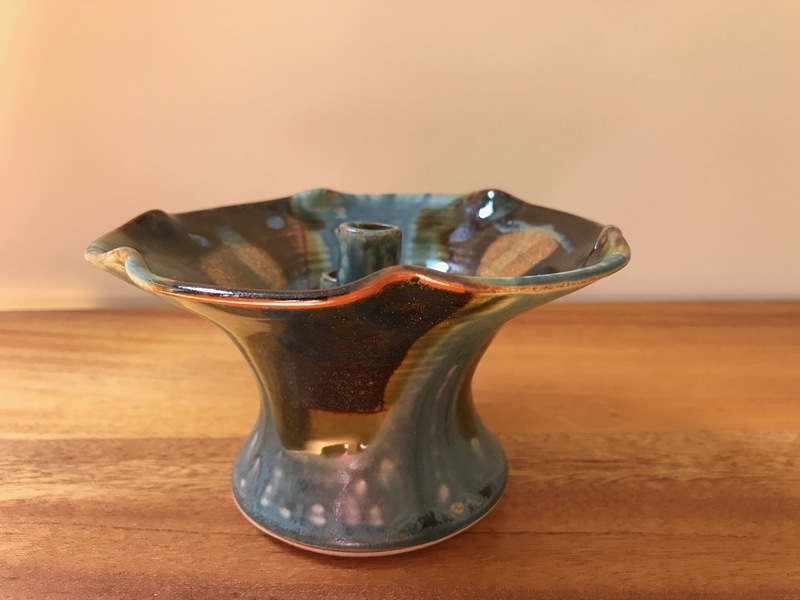 The vase was a house gift from my sister-in-law so it reminds me of her when I use it. The three tubes are open at the base so water flows into them easily. Don’t have to try to fill each one separately. Your arrangements are always splendid and I love your new vase! 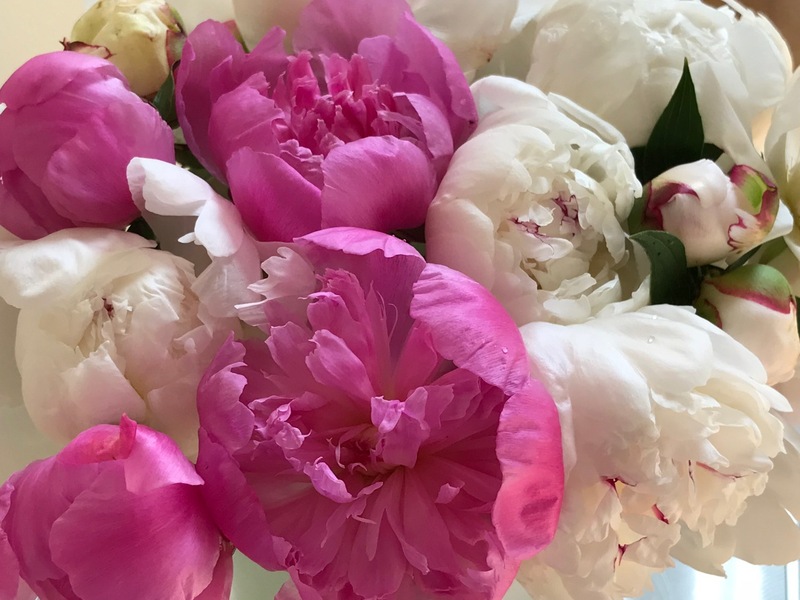 Amazing how long cut peonies can stay in cold storage and still be fresh and beautiful. Thanks Peter. It was interesting to use the grass but still prefer blooms. You managed to spread peony season over several weeks Susie! 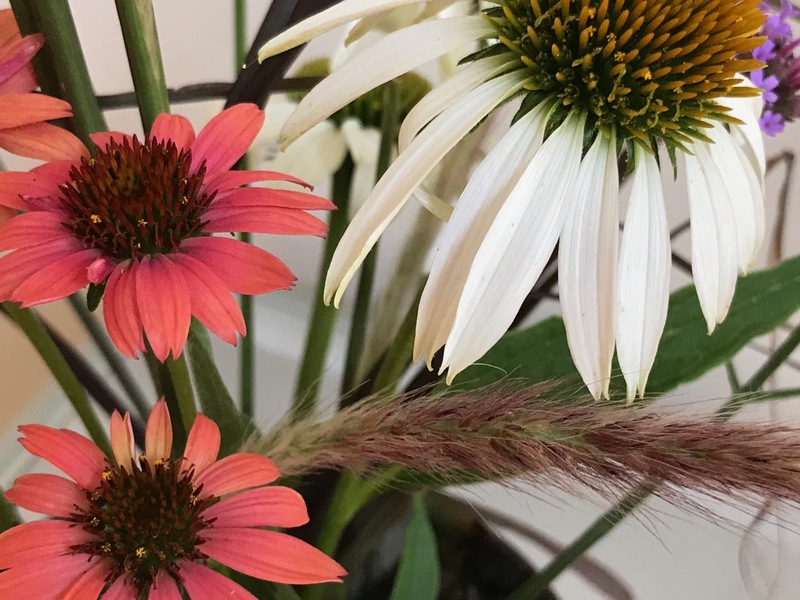 🙂 I love the grass in your vase giving it a summer meadow effect… beautiful Echinacea too. Thanks Cathy. The grass does add its own character and effect to the vase. Best peony year ever!